Sutur Grymer Sterner 2 p. E-Vet metal. 30p/pallet. Farm Dog Fresh Salmon. 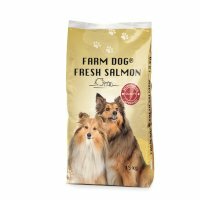 The ideal quality complete food for all grown dogs with a normal energy demand. Dry food, ready for feeding, can be served directly from the sack or with water. The dog must have access to fresh drinking water.